Hey dearies! 2019 is just around the corner and as I have mentioned, I want to make a temperature blanket for 2019. I wanted to talk more into what a temperature blanket is and what you need for it. 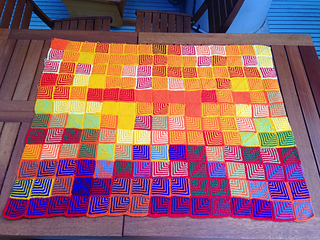 So, for my temperature blanket, I will updating you on what it looks like at the end of every month, rather than posting every square a day, I figured it would be easier to post on what it looks like at the even of every month. However, I will be posting a square a day on my Facebook Page. Let’s talk about some questions I have gotten on my Facebook page about the temperature blanket is. This is just a simple chart, but there is a color that represents every temperature. You don’t have to crochet a square a day, you can do whatever you want to do! I’ll be crocheting a solid granny square a day, but you can crochet a row a day, or crochet a different design a day, whatever you would like to try! As you see here, this person used a ‘purple’ as their base color for this project, which you could do for any and all types of colors. The rainbow theme, for a temperature blanket, is more common because when it all get’s put together, it’s amazing to see what they look like. Best part about seeing these blankets, is that the temperature isn’t the same everywhere you are from. I’m from Maine, and it doesn’t stay in the same temperature all year long. So, we will see a little bit of every color, that I have planned. Do you have to use the same yarn? Not at all! Most people use their leftover yarn that is just sitting in their closet. Or, if you are like me, I go out and buy whatever colors I don’t have and go from there. There also isn’t a brand that you have to stick with either. Whatever yarn you have hanging around, that follows the key, will work! Even if they aren’t all from the same brand. I’ll be using mostly I Love This Yarn, because it’s one of my favorite brands to use, but their yarn can be rather pricey! I do have a few other types of yarn that aren’t the same brand. Usually, I stick with a brand, when it comes to a project, but this being my first time making it, I’ll be using what I have from my yarn stash. What colors are you doing for this blanket? This is the line up of what colors I will be using for my temperature blanket for 2019! I included the brand, just in case any of you would like to follow me in making this blanket as well! Do you have to wait until the beginning of the year to start? Nope! You can start one when ever you would like! A lot of people I know like to start from the beginning of the year to the end of the year, just to see what it would look like, too! Another option you can do, is if you are a faster crocheter and want to blanket from, let’s say 2015, you can always use Google to search for what temperatures it was during that year from where you live. It might be a little hard to find, but it would be amazing to see what each year turned out to me. If you are looking for a later year, Google might not have the information for later years, but if you are a newspaper collector, you might have more luck! How are you joining your squares? Now, this wouldn’t require a sewing needle at all! Basically, you would put your squares back to back and single crochet the seems together. It’s simple for beginners and you would have sort of have two blankets in one. This is a stitch that I LOVE to use because of the fact it hides how you stitched it together. I’ve used it multiple times and it is one of my favorites! Not sure which one I am going to use, but I will show you how to do one of them, when I go live on my Facebook Page. Do you have to make squares? Not at all! You can do squares, hexagons, circles, rectangles, rows, and etc. Be creative and try to do a temperature that you think would be amazing. If you are a beginner, I would start out with squares. You don’t have to do a solid granny square, like I am going to do. A lot of people use a granny square for this type of project, but I like my squares completely squared. Well, here are some examples! If you wish to make one of these, for your own collection, keep a look out on my Facebook Page for more details for how to follow along! This isn’t exactly a temperature blanket, but I wanted to show an example that you can make them in just simple long rows. This is a square temperature blanket, but it is a different design from the original granny square. This one was made with hexagons. Like I said, you can make them using pretty much any time of shape. Another great design, this one looks like they did two types of temperatures, one in the morning and one at night. I will be doing monthly updates, as well, on my blog to show the progress of each month, but I’ll be doing a weekly and daily update for my blanket on my Facebook page!